The assassination of 73-year old Israeli Prime Minister Yitzhak Rabin came at the end of a peace rally in Tel Aviv in favor of the Oslo Accords. Rabin had served two terms as Prime Minister, from 1974-1977 and again from 1992 until his death. He was a soldier with extensive experience combatting Arab states, serving as Defense Minister from 1984-90, yet he was willing to take on equally great risks for the sake of achieving a just and lasting peace in the Middle East. In 1994, the Nobel Peace Prize was awarded to Rabin along with PLO leader Yasser Arafat and Israeli Foreign Minister Shimon Peres for concluding the Oslo agreement. It was seen as potentially a huge step toward resolving the Arab-Israeli conflict, beginning with a partial Israeli withdrawal from occupied territories and the creation of a Palestinian Authority. Rabin was killed on November 4, 1995 by three shots fired by an Israeli right-wing nationalist who opposed the Accords. Hundreds of thousands of mourners attended a ceremony in the square where Rabin was assassinated. His funeral was held November 6 in the presence of leaders from eighty countries, including U.S. President Bill Clinton, Egyptian President Hosni Mubarak and King Hussein of Jordan. The following interviews capture multiple perspectives on the peace talks and on Rabin himself, as a statesman and an individual. James A. Larocco, Deputy Chief of Mission and Chargé d’Affaires in Tel Aviv 1993-1996, was interviewed by Charles Stuart Kennedy in January 2011. Kennedy interviewed Wesley Egan, Ambassador to Jordan 1994-1998, in October 2003, and Robert M. Beecroft, Deputy Chief of Mission in Jordan 1994-1996, in September 2004. Read more about the Arab-Israeli conflict, political assassinations, or peace movements. You can read an excerpt from Dan Ephron’s book on the assassination and the lost chance for peace, excerpted in the November 2015 Washington Post. 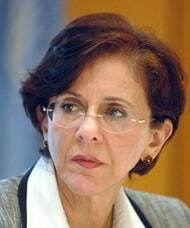 LAROCCO: It wasn’t long after the Oslo Agreement that those who opposed this agreement, on either side, Palestinian or Israeli, took up their pens, their microphones or their weapons to sabotage it. In the streets of Jerusalem, in particular, but also in Tel Aviv, odious posters of Rabin began appearing more and more. Rallies against Rabin, Peres and the peace process became increasingly large and vocal. I recall seeing in a suburb of Tel Aviv a march by Israelis opposed to the peace process with several men carrying a casket with Rabin’s name on it. Terrorism came to Tel Aviv in 1994, not far from the embassy, and this wasn’t the only time terrorists struck in our area. Just a few months before the Rabin assassination, and shortly after Martin Indyk arrived as ambassador; an attack on nearby Dizengoff Street took place with some of our staff in the area (seen left). It occurred around lunch time, as I recall. There were many other attacks throughout Israel, and of course there was an Israel settler attack near Hebron that I recall killed something like 29 Palestinians. 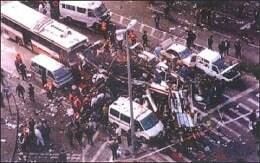 Baruch Goldstein was the perpetrator. I believe I related earlier in the discussion the dinner I hosted for visiting Secretary Perry with Rabin present. This was at a time when the peace process itself seemed in jeopardy because of the increased terrorism. Rabin went into a funk for several weeks. When he came out of it, I happened to be accompanying a Congressional visitor for a call on him. The visitor pressed Rabin on why he didn’t press the pause button on the peace process until the situation calms down. Rabin responded that this is precisely what the terrorists wanted. They wanted Rabin to be reactive, to act as if he’s terrorized by them. 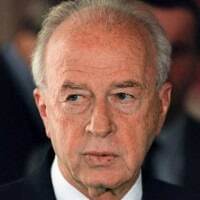 Rabin then said words that have been repeated by others, but which I will never forget: I intend to take on terrorism as if there is no peace, and to work for peace as if there is no terrorism. These were powerful words, sending clear messages to all parties who had a stake in the success or failure of the peace talks. I also remember the pressure we felt from the Israelis against our travel advisories. Now let me be clear: this is not unique to the Israelis. Any countries that take in significant revenues from tourism chafe at our travel advisories. I recall the day after a stricter one came out from the State Department, I was at reception attended by the Mayor of Tel Aviv, Ronni Milo (seen right), and in his unprepared remarks, he talked about how safe Tel Aviv was, and then singled me out and the American Embassy for misleading foreign guests who were thinking about visiting Israel. I was stunned by being singled out this way in front of other diplomats and the media. Ironically, the very next day there was a terrorist strike in downtown Tel Aviv. We never heard another complaint from the Mayor’s office, and over time, the Israelis learned to live with our travel advisories, as all countries do. As for the evening Rabin was assassinated, I was at home. 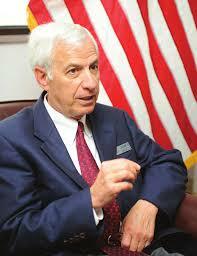 Martin Indyk called me and said, “Rabin has been shot. Please come over to the house. We need to talk to the White House. There will be other things to do.” I went over to the [ambassador’s] residence. Martin said he must go to the hospital to see Rabin and his wife Leah, telling me to stay on the line with White House. Rabin died before I saw Martin again. I had a pit in my stomach. The week before, Martin and I went over to Rabin’s residence to consult on talks related to Oslo II. Peres was phoning in from the talks during the conversation. Why I went with Martin I don’t recall. Martin normally took the political counselor with him. In any case, the meeting broke up, and for some reason, I took longer than Martin to get out the door, trailing him by a minute or so. As I was at the door, Rabin came up to me, grasped both of my hands in his, looked me in the eye and said “goodbye, Jim.” At the time, I was spooked. This had never happened before. Rabin was short on ceremony, and courtesies were not his forte. That evening, I related this event to my wife, saying I couldn’t get this out of my mind. I never saw Rabin again. He was dead within the week. (Larocco pictured at left). The Rabin funeral was only a few days after his assassination. In all honesty, despite the massive number of senior-level U.S. visitors, including Presidents, Secretaries of State, so many members of Congress, governors, mayors, etc., it all went smoothly. There was no advance from the White House and State. We were seasoned handlers of VIPs, so they simply had to put themselves in our hands. No second guessing, no redundancy, just get it done. I must add that all the VIP visitors understood our limitations and helped each other. There were some particularly poignant moments as younger congressmen helped older ones climb Mount Herzl together for the ceremony. The love and respect for Rabin was deeply felt. EGAN: I was at a dinner at the home of the Minister of Planning, Rima Khalaf (seen right)… Rima got a phone call from the palace telling her that Rabin had just been assassinated. There were several other members of the cabinet there; there was nobody there from the royal family. I think my wife and I were the only non-Jordanians who were there. We were absolutely stunned. The King was profoundly affected because he considered Rabin a true partner in the effort to find a way towards peace. He respected him as a military man. He thought that because he was a military man he could talk with him in ways that he couldn’t with either the president of Israel or Shimon Peres, who was the foreign minister. King Hussein in fact didn’t particularly like Shimon Peres, thought he was a professional talker. But he liked Rabin. He dealt easily and directly with Rabin, in person, on the telephone, whatever the circumstances were. They had known each other almost their entire lives, both as enemies and as political figures and as men. It was a very real and special relationship. 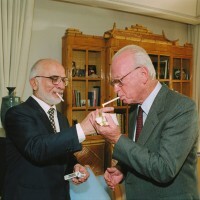 The fact that Rabin was the man with whom Jordan had negotiated peace, and the man on whom they would rely for the implementation of the Israeli side of that peace treaty, and the fact that Hussein genuinely felt that he had a special relationship with Rabin and could deal with him in ways that he couldn’t deal with any other Israeli political figure, particularly any other civilian political figure, made Rabin’s assassination was a terrible blow. The King went to Jerusalem for the funeral, played a very prominent public role in that funeral, and stayed in close touch with Rabin’s widow. He wasn’t politicking. These were very instinctive decisions and reactions…. There was never anyone who could have replaced Yitzhak Rabin in King Hussein’s mind. It was obvious every time you saw them together, every time one of them would describe to you the conversation they just had with the other. Any time either one of them said to us, “we’re going to do this and he’s going to do that,” you could bank on it. It worked and the systems that flowed from those two, the civilian government, the officials, the folks on the intelligence side and the folks on the military side, worked together in ways that reflected the empathy between Rabin and the King. Q: Sitting in Amman, when Rabin was killed, was there a feeling that at least a great start had been made and would continue? EGAN: Yes. In the King’s mind and in the mind of many Jordanians, Rabin was critical to the success of that relationship and the implementation of the treaty. The first question in many Jordanians’ minds was, who was the killer? You can shudder to think what the repercussions would had been if his assassin had been a Palestinian, particularly a Palestinian rejectionist from Hamas or Islamic Jihad who had moved through Jordan on his way to Tel Aviv. I’m sure, I know, that for many Jordanians, including the King, one of the very first frightening questions within seconds of learning of his death was, who did it and what the implications would be. There was great fear at the time that the good work that had preceded Rabin’s death would unravel. 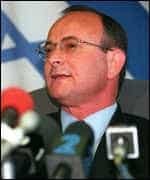 [The assassin] was an extreme right wing Israeli who thought Rabin was negotiating away Israel’s security, military superiority and political influence of the region, that he was negotiating away the future of Israel. As awful as it is to say, thank God it was an Israeli. BEECROFT: Things were basically looking up at that point. You still had the phenomenon of a country [Jordan] whose population was fifty percent Palestinian. You had an economy that was none too strong, because their main trading partner had been Iraq and that option was now closed off with a few exceptions, which I can speak to. That was one reason why Hussein finally decided to take the leap with Israel. The old joke about Jordan being located between Iraq and a hard place had a lot of truth to it. King Hussein was looking for alternatives. Egypt, the biggest and most important Arab country, had long since signed a peace treaty with Israel, although it was a cold peace, and had been readmitted to the Arab league. Basically, Hussein didn’t see a downside. I have to say that for the first year or so after the treaty was signed, the signs were positive. 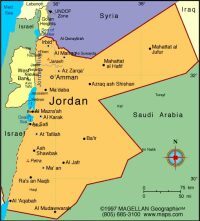 Just to give you an example, the Israelis opened a blue jeans factory in Irbid, which is the northernmost major city in Jordan, near the border with Syria. Jordanians were making blue jeans which were then being shipped to Israel with labels on them that said “made in Israel” and everyone was happy. There was work for the people of Irbid and good quality blue jeans being exported from the region as Israeli. There were other courageous people, 115 lawyers, local entrepreneurs who were looking for ways to open doors with the Israelis, and a few courageous Israelis trying to do the same thing. In late October of ’95, the first annual Middle East/North African Economic Summit was held in Amman – something the U.S. had been pressing hard for. King Hussein was the patron. The Gulf States and North Africans were well represented. Arafat was there. Rabin and a big delegation came from Israel. Secretary Christopher led our delegation. The Europeans were there in force. There were more than a thousand business people there from all over the region. It went so well that even the organizers were surprised. Perhaps the liveliest debate at the whole conference may have been who would host it in 1996; Egypt got the nod, with Qatar in 1997. The U.S. Embassy had a big display at the Marriott Hotel with all kinds of state-of-the-art computer stuff. I took Arafat around to see our displays. He was fascinated – he kept saying “I want this” to his staff. Then, one week after the summit, Rabin was dead. I think we all felt that [Rabin] was so crucial to providing the political will necessary to drive the process. 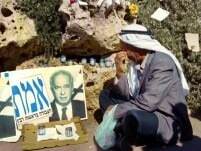 You may recall that King Hussein went to the memorial ceremony in Israel, and cried. He had good reason to cry. There was simply no one who could fill his shoes. 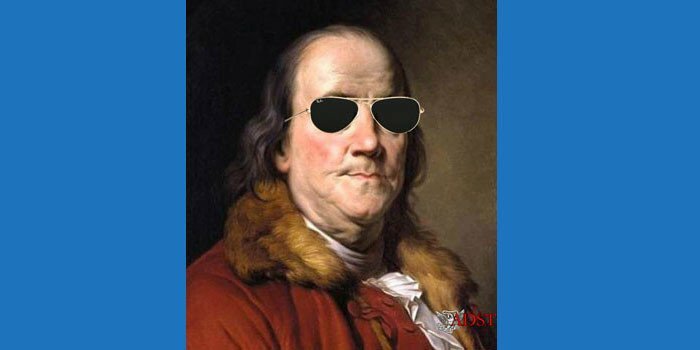 No one else had his combination of vision and credibility.